L.R. Owen Storey was born on November 5, 1927 in Crowborough, England. He received the B.A. degree in Natural Sciences and the Ph.D. degree in Physics, in 1948 and 1953, respectively, from the University of Cambridge. As a graduate student, he studied the natural radio phenomena called "whistling atmospherics" or "whistlers", which was already known to be caused by the dispersion of very-low-frequency (VLF) radio waves from lightning strokes. He found that their propagation paths follow the lines of force of the Earth's magnetic field. This led him to discover the upward extension of the ionosphere now known as the "plasmasphere", which was one of the first components of the magnetosphere to be identified. After leaving the university, Dr. Storey worked successively in England, Canada, and the U.S. before returning to Europe in 1959 as an employee of the French National Center for Scientific Research (CNRS). 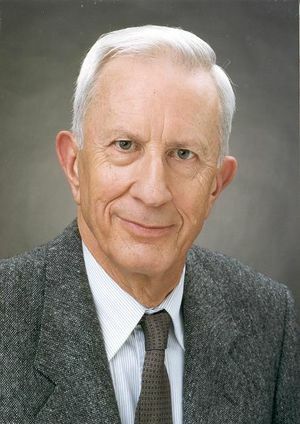 In 1963 he was appointed Scientific Director for the FR-1 satellite program, which was a joint project of the French National Center for Space Studies (CNES) and of NASA. The purpose of FR-1 was to study the ionospheric and magnetospheric propagation of artificial VLF radio waves from transmitters on the ground. The satellite was launched in December 1965 and the data from it was used for a number of years afterwards. In the early 1970s Dr. Storey's research group was transferred from the Paris region to a new laboratory near Orleans, where it undertook two projects arising out of the FR-1 program. One was aimed at developing new methods for direct measurement of the properties of space plasmas, based on the mutual coupling between pairs of dipole antennas. Experiments were performed on rockets, through participation in the West German and Swedish programs for the International Magnetospheric Study 1976-79, and also in a laboratory plasma chamber. The other project concerned wave distribution function (WDF) analysis, a form of direction finding based on multi-component measurements of electromagnetic wave fields in space. In 1983, Dr. Storey joined the research faculty of the Electrical Engineering Department at Stanford University. Beginning in the fall of 1987, he spent two years as a visiting senior scientist at NASA Headquarters in Washington, D.C. He then worked in the National Space Science Data Center at NASA Goddard Space Flight Center, Greenbelt, mainly writing software for WDF analysis. He retired in 1992. Dr. Storey was a member of the AGU and of the EGS. He has published 60 scientific papers. He and his wife lived in the south of France. They had three children. Owen Storey received the IEEE Heinrich Hertz Medal in 1997.